People are visiting your website – great. You know which pages they are going to – even better. But do you know what they are doing once they arrive there? Say hello to your Heatmap. Whilst Google Analytics is, undeniably, an extremely useful asset that all business websites should be using, there are certain things it can’t tell you. Yes, it will detail how many visitors you’ve had and where they went on your site. It can also tell you how many of those gave up and went elsewhere. What it can’t tell you though, is why – why did they decide to leave before converting into a purchase or a lead? This is where heatmaps and click analytics software come in. In a nutshell, heatmaps provide you with a visual representation of engagement on a particular page. The “hotter” the engagement, the “hotter” the visual. True to their name, heatmaps display those areas which generate the most attention with warmer red, orange and yellow colours. On the other hand, those areas with less engagement are a cooler blue in colour. The data is often compiled by monitoring a combination of clicks, mouse movements and hovers. Together with analytics data, heatmaps are a great way to discover what people are doing on your website and detail whether users are focusing on your most important areas. 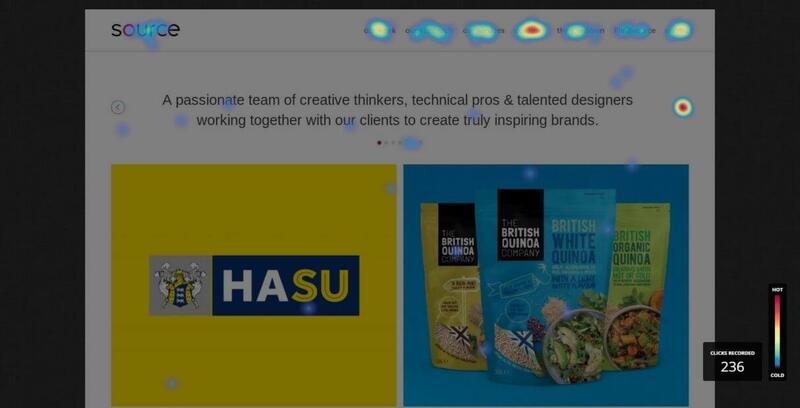 It’s worth noting that, whilst eye-tracking heatmap software is available – which reports on what people are physically looking at on a website, without having to move a mouse – this is usually much harder to apply and more expensive. A heatmap can help you decide whether any changes are required to a page. For instance, if your call-to-action button isn’t getting as much attention as you’d like, heatmaps can show you why; is there an advert nearby which is absorbing attention? If so, maybe the call-to-action should be moved to a more prominent position. What is the best heatmap software? If you’re new to heatmaps and their functionality, Hotjar is a good place to start. It offers a 15 day free business trial to give you a good understanding of how the whole process works. Use one email address to set up an account and then, if required, it allows you to produce sub-accounts under the same address. You can add multiple users to view accounts, enabling others in your organisation to view the data. The set-up is simple; just add the tracking code (or ask your web developer to do this for you). Decide which pages you want to focus on and create heatmaps using their simple step-by-step process. Filter the data to view by device and/or type (click, move or scroll). Heatmaps are downloadable and display how many clicks you received per section as well as how many pageviews. A really interesting feature is their recordings section. When people visit the site, Hotjar literally records their movements for you to watch back later in video form. These provide a huge amount of information including the user’s location, details of what and how many pages were viewed, how long the recording is, what device, browser and operating system were used, and the date. You can even bookmark the most telling ones to save for later. Use the funnels section to track conversions. As well as listing sessions and conversion rates, the funnels will also allow you to view a recording of those people that converted into a lead or sale. Other features include; asking visitors for their opinions on your website with polls, surveys and recruiters, which invites them to a live user test screen sharing. Offering everything Hotjar provides and more, Mouseflow is a great tool if you’re after something a little extra with minimal effort on your part. Set-up is simple if you’re looking for something to start straight away as Mouseflow does a lot of the work for you. One final thing to note is your own traffic. You probably visit your website more than most people so whenever you use a heatmap, be sure to block your own IP address as soon as possible. That way, you’ll ensure your own visits to the website are excluded and won’t affect the final statistics. At Source, we don’t just stop working on a website after pressing the launch button. Our technical and marketing teams work together with our clients to ensure their business websites perform to the best of their ability. If you’re interested in finding out more about heatmaps and what paths are taken by your website users, give our team a call.